Nowhere else in the LA metro area encompasses so many aspects of the city's colorful history as downtown Los Angeles does. Touring it is like zipping around in a time machine. One minute, you're at the city's beginnings and five minutes later, you behold the downtown Los Angeles of future in the making, past snuggled up against present in a melange that typifies L. A. at its chaotic best. As nice as it seems to visit these downtown sights in chronological order, it isn't practical. Our tour of Downtown Los Angeles starts at Grand Avenue and 3rd Street. It's a loop that goes north to Chinatown, so you can start and end anywhere that's convenient for you. This view of the downtown Los Angeles skyline was taken from Sunset Boulevard, just on the edge of twilight, giving it a dreamy look. Downtown Los Angeles may be the most underappreciated destination in all Los Angeles. When I started planning this Downtown Los Angeles tour, I thought it would take less than a day, but by the time it was done, it took more than two just to see everything once, and I had to forego shopping in the downtown Los Angeles Garment District just to fit it all in. 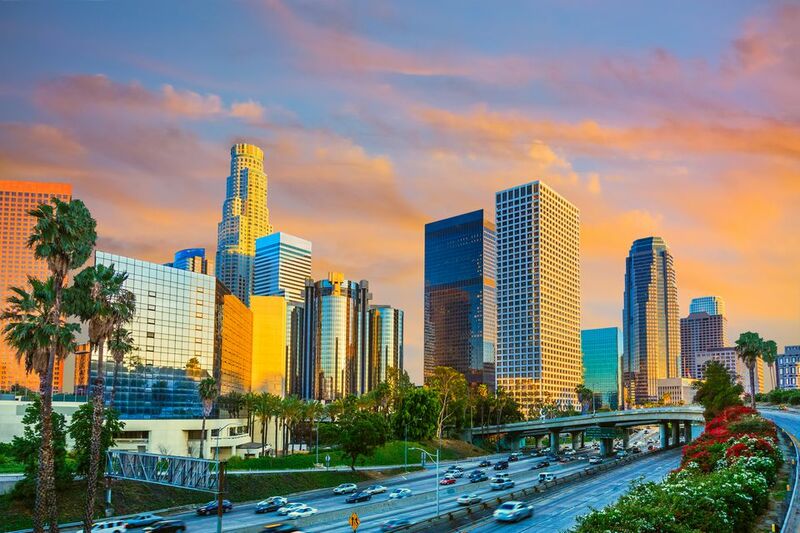 Perhaps the most unrealistic and at the same time seductively beautiful images of downtown Los Angeles were used in the television series LA Law: crystal-clear, blue skies and sunshine seemed to be the daily forecast. On the big screen, Blade Runner presented future Los Angeles as perpetually dark, polluted and dreary. Other films present downtown as a gritty place you might think should be avoided. The Broad: A new museum under construction, due to be completed in 2014. LA Live and the Staples Center: Downtown LA's modern entertainment complex and the home of the LA Lakers, LA Clippers and the LA Kings hockey team. If you visited everything on the list above, walking the route described on the Downtown LA Tour Map at the end of this guide, it will take 4 to 6 hours and you'll walk 10 miles or more. All the sites are marked on the map. If you want to take a shorter one, you can easily plot your own route, keeping in mind that where we choose one of several routes between sights, it may be because of interesting things you'll see along the way (or unpleasant ones you'll avoid). If you're just starting: This is where we like to start the downtown LA tour. From the Museum of Contemporary Art: Facing Grand Avenue in front of the museum, turn left and walk southwest on Grand Avenue for about 2 blocks. It will be on the same side of the street as the museum. If you want to go directly to the Biltmore Hotel from other parts of the city, you can take the Metro to Pershing Square. If you're driving, see the GPS notes above. Built in 1923 as the Los Angeles Biltmore, the Millennium Biltmore is a hotel in Renaissance style, whose elegant public spaces overflow with gilded decoration. It takes up over a city block and rises 11 stories high. A stroll through the Rendezvous Court (which until the 1980s was the hotel's lobby), upstairs into the hallways with a side trip down the Hall of History to see some great photos from the old days is a fun diversion. The Biltmore's many distinctions include serving as the site of eight Academy Award ceremonies between 1931 and 1942 and hosting John F. Kennedy's acceptance speech after his 1960 Presidential nomination. The Beatles stayed at the Biltmore during their first U. S. tour in 1964 and more recently, the semi-finals of American Idol took place here. To learn more about the hotel's history, join the Los Angeles Conservancy walking tour given every Sunday afternoon. If you're thinking about a stay, see the reviews at Tripadvisor. From the Biltmore Hotel: Exit onto Grand Avenue and walk toward 5th Street, continuing northeast on Grand Avenue for about 2 blocks. It will be on the same side of the street as the hotel. From The Broad: Facing Grand Avenue in front of the museum, go right about 1.5 blocks, crossing Grand Avenue at 2nd Street. If you want to go directly to MOCA from other parts of the city, you can take the Metro to Pershing Square. If you're driving, see the GPS notes above. One of several museums located downtown, the Museum of Contemporary Art (MOCA) features art works created starting in the 1940s. This sculpture by Nancy Rubins outside their entrance exemplifies my reaction to much of their holdings, the male figure giving the universal gesture for "I don't get it." If you're a fan of contemporary art, the museum's holdings include thousands of creations in all media, and selected items are on view year round. Even if you aren't interested in the art, the MOCA gift shop carries some nice, handmade gift items that might make better souvenirs than another lousy t-shirt. Next door to MOCA on the upper level is the California Plaza Watercourt, a pretty public space that hosts free summer concerts and performances. If you need a "rest" stop, you'll find restrooms in the lobby of the Omni Hotel, which is next door. MOCA also has locations at the Geffen Contemporary 152 North Central Avenue in Little Tokyo and the Pacific Design Center at 8687 Melrose Avenue. Technically, admission to the Broad Museum is free, but you need a reservation to get in. That's been a nearly impossible to ticket to obtain ever since they opened in 2015. From the Disney Concert Hall and Music Center: Facing Grand Avenue in front of the Disney Hall or Music Center, go right. It is on the same side of the street as the Disney Hall, just past 2nd Street on Grand. If you want to go directly to The Broad from other parts of the city, you can take the Metro to Civic Center or Pershing Square. If you're driving, see the GPS notes above. The name rhymes with "road" and it's a new contemporary art museum built to house the collections of philanthropists Eli and Edythe Broad and The Broad Art Foundation. The nearly 2,000 works are among the most prominent holdings of postwar and contemporary art worldwide. The building, designed by Diller Scofidio + Renfro features an airy, honeycomb-like exterior structure that provides filtered natural daylight to the block-long gallery. It is scheduled to open to the public in late 2014 and it will offer free general admission. From The Broad: Facing Grand Avenue in front of the museum, go left. Both the Disney Hall and the Performing Arts Center are on the same side of Grand as the museum. From Our Lady of the Angels: Turn right on Temple Street toward Grand Avenue. Turn left to walk along Grand, crossing Grand using the crosswalk in front of the Music Center. If you want to go directly to the concert hall and music center from other parts of the city, you can take the Metro to Civic Center. If you're driving, see the GPS notes above. A downtown Los Angeles icon almost from the moment it opened in 2003, the Disney Concert Hall is the newest part of the performing arts center. Designed by Los Angeles' premier architect Frank O. Gehry, the Disney Hall is modern Los Angeles at its best, with an approachable interior and a sleek design. Use this guide to find out all about visiting it or going to a concert there. The lobby areas are open to the public and worth a quick trip inside, where you'll also find restrooms if you need them. The Disney Hall is just part of a performing arts center started in the 1960s when the Dorothy Chandler Pavilion (seen just beyond the Disney Hall in this picture) was built. The Los Angeles Opera, Los Angeles Master Chorale and Los Angeles Philharmonic make their home at the Music Center, along with the esteemed Center Theatre Group who stage shows in the Mark Taper Forum and Ahmanson Theatre. A performance at any of these venues would be a nice addition to a stay in downtown. The outdoor courtyard at the Music Center is especially pleasant on a summer evening just before showtime, and across Grand Avenue (and just below street level), you'll find an exuberant water fountain surrounded by good places to sit and rest. From the Disney Concert Hall and Music Center: Use the crosswalk in front of the Music Center to cross Grand Avenue. Turn left and walk to Temple Street, cross it and turn right on Temple to reach the cathedral entry plaza. From Chinatown: Walk south on Broadway, crossing the US Hwy 101 overpass. Turn right onto Temple Street and walk about 1.5 blocks to the cathedral entry plaza. If you want to go directly to Our Lady of the Angels from other parts of the city, you can take the Metro to Civic Center. If you're driving, see the GPS notes above. There's a parking lot at the cathedral, with the entrance on Hill Street. Completed in 2002 and designed by Spanish architect Professor José Rafael Moneo, the Cathedral of Our Lady of the Angels is the "home" cathedral for the Archdiocese of Los Angeles. Its name recalls the earliest days of Los Angeles, founded in 1781 and called El Pueblo de Nuestra Señora, Reina de Los Angeles. In this picture, you can see one of the bells that mark the El Camino Real, the old Spanish road that connected California's Spanish missions. In the courtyard, you'll also find a whimsical sculpture garden and a pretty fountain, but the overall appearance is a little sterile and off-putting. Don't let that stop you from going inside to see a place of worship that's modern and yet tied to its past. Stop at the small kiosk near the entry gate to get more information about touring the cathedral. Also in the courtyard area, you'll find restrooms if you need them. This city high school is not open to the public, but its building is so distinctive that you'll probably wonder what it is when you see it. You'll notice it as you walk toward the cathedral or may get a glimpse as you walk along Temple. This photo was taken just past the cathedral from the Hill Street bridge which crosses the US Hwy 101 freeway. In case you're into such details, the building's Designer of Record was the Austrian firm Coop Himmelbau. When it opened in 2009, it was called Central Los Angeles Area New High School No. 9. If you've already been to the cathedral, continue southeast on Temple to Broadway and turn left, but before you go all the way up to Chinatown, read what we have to say about it. If you're coming from Chinatown, keep walking northwest along Temple toward the cathedral. As early as 1852, a Chinese settlement was recorded not far from here. After the community moved to its current location, the Central Plaza was dedicated in 1938. A number of Chinese-themed buildings were built, and Chinatown Los Angeles became a popular tourist attraction. Movies filmed in Chinatown Los Angeles include Rush Hour, Lethal Weapon 4 and of course, Roman Polanski's 1974 classic Chinatown. From Our Lady of the Angels: In front of the cathedral entry plaza on Temple Street, turn left. Walk about 1.5 blocks to N. Broadway. Turn left and walk 3 blocks to Alpine Street (where you can side trip to the temple mentioned below) or continue another 1.5 blocks on Broadway to the Old Chinatown Plaza. From Phillippe the Original: Facing Alameda Street in front of the restaurant, turn left. Walk about 2 blocks north to Alpine Street and turn left. Side trip on Alpine to the temple as described below or turn right onto Broadway and continue another 1.5 blocks on Broadway to the Old Chinatown Plaza. If you want to go directly to Chinatown from other parts of the city, you can take the Metro to the Chinatown station. If you're driving, see the GPS notes above. These sights are listed in order if you are walking north on Broadway from the cathedral. Thien Hau Temple: It's a two-block detour to visit a beautiful, authentic-feeling Taoist temple. Turn left (northwest) on Alpine and walk 2 blocks to Yale Street. The temple is on the left at 750 Yale Street. It's dedicated to the goddess of the sea and patron saint of sailors and fishermen. It smells of incense and is filled with red and gold, the walls lined with personal Buddha statues placed there by individuals. Respectful visitors are welcome and photographs are allowed. If you like it, make a small donation to help with its upkeep. Old Chinatown: So many movies have been filmed in this little piece of Los Angeles that it feels almost like you're on a movie set when you walk into the plaza. Created in the late 1930s, it is flanked by gates at Broadway and Hill Streets emblazoned with the word "Chinatown." The architecture is charming and you'll find a few shops and restaurants. If you're a fan of his kung fu movies, you'll find a 7-foot-tall statue of Bruce Lee - which just like Lee himself is larger than life. You can learn more about the history of the Chinese in city and about Chinatown Los Angeles at the Chinese-American Museum in the nearby El Pueblo historic district. If you've been to the vibrant Chinatowns of San Francisco, Vancouver or New York City, you may find Chinatown Los Angeles boring in comparison. If you do decide to go, this tour will take you to its most interesting sights. Chinatown Los Angeles is roughly bounded by Alameda Avenue, Yale Street, Bernard Street and Cesar Chavez Avenue. You'll find the Chinatown Los Angeles dragon gate at N. Broadway and Cesar Chavez. Central Plaza, with its neon sign, which has become iconic for Chinatown Los Angeles is on N. Broadway near Bernard. Find out more at the Chinatown Los Angeles Website or take one of their monthly Undiscovered Chinatown walking tours. From Chinatown: Walk southwest on Broadway toward Alpine. Turn left on Alpine, then right onto N. Alameda Street. It's about two long blocks from there to the restaurant at the corner of Alameda and Ord. From Union Station: Facing Alameda Street in front of the station, turn right. Cross Alameda Street at Cesar Chavez, then continue north on Alameda to Ord Street. If you want to go directly to Phillippe's from other parts of the city, you can take the Metro to Union Station. If you're driving, see the GPS notes above. One of the classic places to eat in Los Angeles, Philippe is the home of the "French dipped" sandwich, and seems to be as popular today as it was when owner Philippe Mathieu invented the famous sandwich after he accidentally dropped a sliced French roll into a roasting pan, or so the story goes. Cole's, also in downtown lays its claim to having originated the dish, but no matter who did it first, the sandwich is the same: the cut surfaces of a French roll are dipped into hot meat juices, filled with sliced meat and served. If you want yours really wet, ask for a double dip. In other regions, French dipped seems to be synonymous with roast beef, but at Philippe you can order chicken, lamb, ham, pork or beef. Cheese is optional and the pickled eggs are a good accompaniment, if you like that kind of thing as much as I do. Regulars like to add a little of Philippe's special mustard, but one small taste left my tongue burning for several minutes. Take it easy until you get an idea of how hot it is. Join any of the lines that snake from the counter into the dining area, order and pay, and take your tray to one of the long, communal tables. It's inexpensive, the sandwiches are delicious and the place is unparalleled for people-watching as every imaginable kind of local and tourist traipses in for a bite to eat. Some say Los Angeles' Union Station is America's last great railway station, and they could be right. Built in 1939 to consolidate passenger terminals of three different railways, Los Angeles Union Station still serves as a transit hub. You can catch an Amtrak train or connect to the MTA Red and Gold lines at Los Angeles Union Station. Even if you're not catching a train, it's a lovely building to wander through. From Phillippe the Original: Facing Alameda Street in front of Phillippe's, turn right. Cross Alameda Street at Cesar Chavez, then continue south along Alameda. From El Pueblo de Los Angeles and Olvera Street: From the east side of Olvera Street and the plaza, cross Alameda Street to the station. If you want to go directly to Union Station from other parts of the city, you can take the Metro or Metrolink to Union Station. If you're driving, see the GPS notes above. Pretty on the outside with a harmonious mix of Spanish Mission, Moorish and Streamline Modern architectural styles, Los Angeles Union Station is best enjoyed from inside. It's clean and carefully renovated, with original light fixtures, inlaid stone floors and tiled walls. Photographers with cameras in hand and little children peering up at the painted ceiling designs are common sights inside Los Angeles Union Station, and the original waiting area seating is so elegant that it's hard to resist plopping down for a moment to enjoy it all. You'll also find TRAXX restaurant in the middle of Los Angeles Union Station, a good excuse to linger and look around some more. If you need to use a restroom, you'll find them here. Los Angeles Union Station is such a beautiful classic train station that it's often featured in films, including Blade Runner, Silver Streak and The Italian Job. The LA Conservancy offers guided tours of Los Angeles Union Station once a month. Reservations are required. From Union Station: Cross Alameda Street in front of the station and it's more or less straight ahead. From City Hall: Walk northeast on Main Street, over the US Hwy 101 overpass and it's on the left about a half block past the freeway. If you want to go directly to this area from other parts of the city, you can take the Metro or Metrolink to Union Station. If you're driving, see the GPS notes above. Parking in this area can be difficult, but you'll find several public lots by circling the area on Cesar Chavez Avenue, North Spring, Arcadia and Alameda Streets. El Pueblo de Los Angeles is where the city began in 1781, founded by King Carlos III of Spain to grow food for the soldiers. A surprising 27 buildings survive here, including the Avila Adobe, the city's oldest structure built in 1818 and the city's oldest brick house. The El Pueblo website says you can pick up a self-guided tour brochure and see a film about Los Angeles' early history at their visitor center in Sepulveda House, approximately half way down Olvera Street on the west side. Hopefully when you visit, the person on hand will be more interested in helping you than in reading a magazine. The most popular activity in this historic district is shopping, and it's a wonder this area isn't called Mexicotown for the Mexican market along Olvera Street (more of an alley than a street), originally named for a local judge and converted into a market in the 1930s. You'll find a nice selection of leather goods, sandals and decorative items in the Olvera Street market, and several popular Mexican restaurants to provide sustenance should all the shopping wear you out. The Studio of Southern California History also offers tours on a periodic basis and so do Las Angelitas del Pueblo. From El Pueblo de Los Angeles and Olvera Street: Go southwest on N. Main Street, crossing the US Hwy 101 overpass. City Hall is about 1.5 blocks past the freeway. It faces Spring Street, but you can see it nicely from Main Street, which will take you to Little Tokyo. From Little Tokyo: Walk northwest on E. 1st Street to Main Street and turn right. This distinctive building is not only the seat of city government, it's also one of the city's most-recognized symbols, appearing on every LAPD officer's badge. It's shown up in the movies and on television, with some of its more famous roles being the Daily Planet on the Superman television series and the location of Joe Friday's office on Dragnet. When built in 1928, city ordinances limited structures to 13 stories because of earthquake fears. City Hall was granted an exception and remained the tallest building on the Los Angeles skyline until the 1960s, when the restrictions were removed. City Hall underwent seismic rehabilitation and renovation in the early 2000s. The Los Angeles Conservancy offers guided tours of City Hall once a month. Reservations are required. A National Historic District and focal point for local Japanese-Americans, Little Tokyo offers a lot to see. You'll find the expected Japanese restaurants and shopping in Little Tokyo, but there's much more. It's roughly bounded by Los Angeles, Alameda, 3rd and First Streets. From City Hall: Walk southwest on N. Main Street, with City Hall on your right. Turn left at E. 1st Street to get to Little Tokyo in a few blocks. From Grand Central Market: Exit the market on either end and walk a short distance to W. 2nd Street and turn right. Follow W. 2nd to the Japanese Village Plaza which is just past S. San Pedro Street. If you want to go directly to Little Tokyo from other parts of the city, you can take the Metro or Metrolink to the Little Tokyo station. If you're driving, see the GPS notes above. If you're following the walking route we suggest, an interesting timeline runs along the sidewalks, showing how each address was used in different time periods. Just look down to see it. A Little Tokyo highlight is the Japanese American National Museum at 100 North Central Avenue, the only museum in the country focused on Americans of Japanese ancestry. Exhibits include original barracks from the Heart Mountain internment camp. Nearby is the Go for Broke Monument, honoring Japanese American veterans of World War II and at 244 S. San Pedro Street. Next to the museum is Chado tea room, a good place for a pick-me-up and one of the best places we've ever seen for buying tea to brew at home. Across the street is the Japanese Village Plaza, where you'll find lots of shops selling Japanese goods, along with Japanese markets and restaurants. Yagura Tower, just outside its entrance on 3rd Street is a replica of a rural Japanese fire lookout tower. If you like Japanese gardens, the James Irvine Japanese Garden is at 244 S. San Pedro Street. If you want to explore more of Little Tokyo, the Japanese American National Museum offers guided tours. The Little Tokyo Business Association also suggests a walking tour itinerary. No matter how you're touring, Little Tokyo Koban is a combined police substation and visitor center, located at 307 E. First Street. The Geffen Contemporary museum (part of the Museum of Contemporary Art) is also in Little Tokyo. Every August, Nisei Week adds extra color and fun to Little Tokyo, with parades and festivals. The Japan America Theatre stages Kabuki classics and historical dramas. From Little Tokyo: Exit Japantown Plaza onto E. 2nd Street and turn right. Walk along 2nd Street for about 5 1/2 blocks to S. Hill Street and turn left. From Angels Flight: From the Hill Street (bottom) side of Angels Flight, you don't need directions. You can see the market diagonally across the street. From the top side of Angels Flight, walk on S. Olive Street to W. 2nd and turn right. If you want to go directly to Grand Central Market from other parts of the city, you can take the Metro to Pershing Square. If you're driving, see the GPS notes above. Since 1917, there's been an open air market in this location, and it's one of those rare places in Los Angeles that doesn't seem to have changed much in almost a century. Historic photos show shoppers poring over the produce and diners enjoying a meal under neon-lit counters. It's little different today, with lots of inexpensive (and yummy-smelling) food vendors, stalls selling a starting variety of dried chili peppers and restored, classic neon signs overhead. Grand Central Market is a great place for people-watching, or for an inexpensive and quick meal. And it's a good place to go if you have to "go" - if you know what I mean. Your destination will be different, depending on whether you're going up or down. See the GPS information below. In the early 1900s, a posh residential neighborhood crowned downtown's Bunker Hill. To help local residents get up the hill's steep incline, the Angels Flight funicular was built, with two counter-balance cars named Olivet and Sinai easing the trip up and down the steep hill for a fare of only one cent. By the 1960s, urban redevelopment razed the neighborhood to make room for a more modern downtown and the railway was taken down and put into storage. Billed as the "shortest railroad in the world," Angels Flight was put back into operation just a half block from its original location in 1996 as part of the California Plaza project. Unfortunately, it's been plagued with issues since then and seems to be closed as often as it's open. I hope you have better luck finding it running than I have. As a side note, you'll find a stairway next to Angels Flight, a tempting alternative to get to the top of the hill from Spring Street. However, in late 2013 the gate at the top was locked. Try taking the regular sidewalk at either end of the block instead. The district runs along Broadway between 3rd and 9th Streets. Set your GPS or maps app to 615 Broadway which is the Los Angeles Theatre, just across from The Palace or to 307 Broadway which is the former Million Dollar Theatre. The Pershing Square Metro station is closest to it. In 1931, New York's Empire State Building staked its claim as the world's tallest building, but across the continent, downtown Los Angeles boasted its own record. Six blocks here, along Broadway between Third and Ninth Streets, held the world's greatest concentration of movie houses, gilded venues that often eclipsed the films they played, with more than 17,000 seats among them. Entrepreneur Sid Grauman built some of the area's first and biggest theatres, but later triggered the area's decline when his Chinese and Egyptian Theaters enticed patrons to the new Hollywood boomtown eight miles away. When people moved to the suburbs after World War II, Broadway's grand dames, abandoned, slid into disrepair. Twelve surviving movie palaces form the National Trust for Historic Preservation's Broadway Theater and Commercial District, but the designation provides little protection. According to the National Trust, people who own private property listed with them can dispose of it as long as there is no Federal involvement. These landmarks' continued existence ultimately depends on people who care. The district officially runs from 3rd to 9th Street, but without a tour guide (or a keen eye), you may find yourself tramping along, wondering what it is you're supposed to be seeing. Website Seeing Stars has a Broadway Theatre District Guide that might help, but if you're interested enough to want to visit, a better option is the Los Angeles Conservancy tours of the Broadway Theatre District, given weekly. Not only will you have someone along to explain it all, but you'll get a chance to get inside some of the theatres, both ruined and renovated that are otherwise closed to the public. Another way to enjoy the grand old movie palaces is during the annual Last Remaining Seats series, when classic films are shown in selected locations. This event takes place during May and June and sells out fast, so plan ahead. Its official name is the Fashion District, but most people call it the Los Angeles Garment District, so we do, too. Much of the LA Garment District is geared toward wholesale buyers, but you can also shop for bargains and knock offs at Santee Alley, check the monthly sample sales, and find some places that also sell retail, including small local designers you may not find elsewhere. It's a huge place with thousands of stores and you'll need some help to get started. Find out how to tackle the Los Angeles Fashion District. Shopping nirvana is bounded by I-10, 7th St, San Pedro St and Broadway (more or less). Two of the most popular destinations are the California Market Center (110 E. 9th) and New Mart (127 E. 9th). Santee Alley is between Olympic and Pico Boulevards. Set your GPS to 300 East 9th Street, which is the Starbucks at the corner of 9th and Santee. The nearest parking lots are at 1000 Maple Avenue and 929 Wall Street and it's best to use them to avoid potential parking tickets. There are no Metro stations nearby, bur downtown DASH bus routes D and E run through it. If you found this page by searching for Staples Center Tour, we'll start by telling you that they don't offer one. However, there's plenty to do in around it at L.A. Live. In case all that tires you out, you'll find a Ritz-Carlton hotel and the JW Marriott at LA Live right next door. Together, they have almost 1,000 rooms. LA Live's official address is 800 W Olympic Blvd. The nearest parking lots are at 888 West Olympic Boulevard and 961 South Figueroa Street. The nearest Metro stop is Pico Station. This tour began with an assertion that not all the stereotypes of Los Angeles are true. I don't want to leave you without talking about all aspects of downtown Los Angeles, good and bad. This under-appreciated part of the city offers so much to see and do that it took me two days just to visit all the sights in this tour. With continued development and many older buildings being renovated into residential units, downtown should grow more vital and fun. Nevertheless, parts of downtown Los Angeles have been neglected for decades, and a noticeable homeless population can be seen on the streets. Downtown hotel concierges caution their visitors to be cautious after dark. In spite of that, Neighborhood Scout shows that downtown has one of the lowest crime rates in the city. What you're more likely to encounter are pockets with rundown buildings, dirty sidewalks and small shops selling cheap goods. Riding the DASH bus will help you stay out of the fray, but at the same time distances you from experiencing everything that is downtown Los Angeles. Click on the map above to get a larger-sized version - or go to the interactive version. You can get to downtown Los Angeles by public transportation, which may be your best bet during the week to beat traffic. On weekends, take advantage or lower rates at the downtown Los Angeles hotels, get some tickets for a performance at the Music Center and leave the car in the parking garage until you're ready to go home. Despite the city being so large, downtown Los Angeles is relatively small, and the average walker can see much of it on foot. Besides sparing your mood from parking hassles, walking allows you to see more and explore. If you get tired, the DASH bus system covers most of the area described on this tour. Their routes are different on weekdays than weekends, and their prices extremely reasonable (50 cents per ride in late 2013). If you'd like an audio companion as you explore downtown, try the free MP3 podcasts offered by the Los Angeles Conservancy. For the history or architecture-lover, the Los Angeles Conservancy also offers guided walking tours on a weekly basis, but reservations are required. DowntownLA.com also has a lot more information than we've given you here.